The Education Quality and Policy Office supports faculties and departments in developing their quality assurance and enhancement procedures within the frameworks set out by the General Board. Local quality assurance arrangements are monitored and reviewed through the General Board's Education Committee and its sub-committees, which set out policy and guidance frameworks within which Faculty Boards and equivalent boards operate. The Education Committee works closely with the Senior Tutors' Committee and the Board of Graduate Studies, and also liaises with the Councils of the Schools. Virtually all central bodies have joint College and University membership which encourages dissemination of information on initiatives at an early stage. For example, the Senior Tutors' Committee has representatives on University bodies such as the General Board's Education Committee, and a Senior Tutor chairs the Undergraduate Admissions Committee jointly with the Pro-Vice-Chancellor (Education). 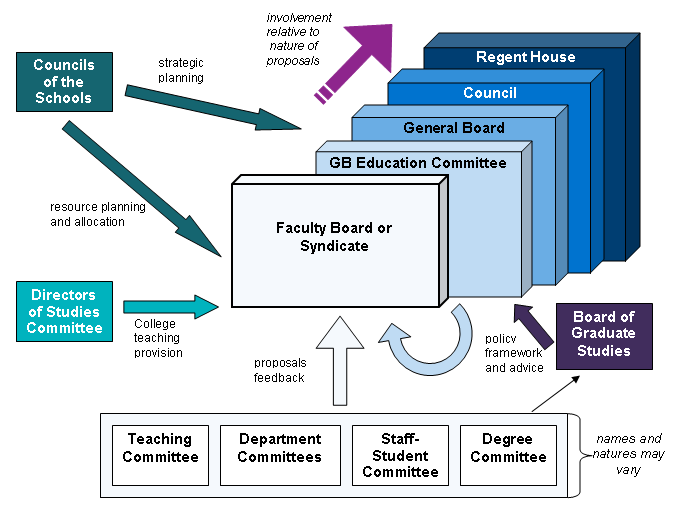 The University's democratic governance structure allows for approval and consultation at a number of levels. For major changes to teaching provision, formal approval is needed by the General Board and Council. The Regent House is then given the opportunity to comment and advise on the proposals and, if called for, vote on their approval in a formal ballot. Most of these bodies elect student representatives; further details can be found on our Student Election pages.